Last month, I was unexpectedly introduced to Rose and much to my surprise I became enthralled by the female lead coming of age story. In fact, the first five issues were so strong, that I likened many of its stylistic direction and story to that of Star Wars, but more specifically, Episode V. Which, in nerd-speak, is just short of nominating it for the Congressional Medal of Honor. The tale is set in a fantastical land that is ruled by a ruthless and murderous queen on a quest to solidify her hold of the throne by ridding the world of all magic; save her own. Which leads to the exciting conclusion (i.e., battle) of the fifth installment where the titular Rose is reunited with her “Khats” (a.k.a. spirit animal/soul mate). Thus, achieving what feels like a strong climax to the first arc of the story and directing us toward what would become the greater exodus of their growth and development as a team. Although that was not the case. Issue six takes off immediately after the final panels of the previous issue, as Rose has saved the life of the man sent to kill her. Also, Rose’s new partner-in-crime has been shackled by an enchanted collar which prevents him from “bonding” with her. All this, while her rebel friends are engaged in a battle against the Queen’s forces at the town of Millhaven. The dialogue in this billed “finale” was very well written and Meredith Finch continues to display her passion for the title through solid character interactions, individual behaviors, and plot development. Each of the main characters remains true to what has been establish in the series’ lore until now and the events which unfold over the course of the issue will likely reverberate for several issues to come; if not throughout the remainder of the series. Additionally, letter work executed by Rae remains strong and suits each character type perfectly, particularly those of Thorne and Queen Drucilla. But while the quality of Finch and Rae’s pens have remained sharp, the same cannot be said of Ig Guara and Triona Farrell’s. Although it pains me to say it, I was left less than impressed by the artwork displayed in issue six. With the exception of only a very few select panels, I had to continually refocus on the artwork. At one point, I literally stopped to check the cover just to make sure that Guara and Farrell were still the artists for the title. Once confirmed, I decided to push through my first read, then go back and analyze the artwork on its own. Unlike the first five issues, issue six feels unpolished and sketchy, in many instances line work seems incomplete and does not serve to bring out the details in the characters. Yet, in others, lines overpower the character silhouettes and draw peripheral attention away from what should be the focal points of the images. Which, if intended to be stylistic, has never been the case before and begs the question…why now? After a side by side comparison of several character (e.g., Queen Drucilla, Ila, and Will) close-ups from issues four, five, and six, there is a clear drop in quality in the latest chapter. Additionally, skin tones and/or colors seem pale in comparison to previous entries in the series. This could potentially be attributed to the digital format versus print but no such variations were noted with previous releases. Despite any perceived shortfalls in this issue’s artwork, Rose continues to be strong series and this issue delivers in pushing the story in an interesting direction as we get to learn a lot more about the characters through both their actions and, in one case, through an inadvertent telepathic connection. However, much of it felt supplemental and lacked the expected “pay-off” of a true finale. 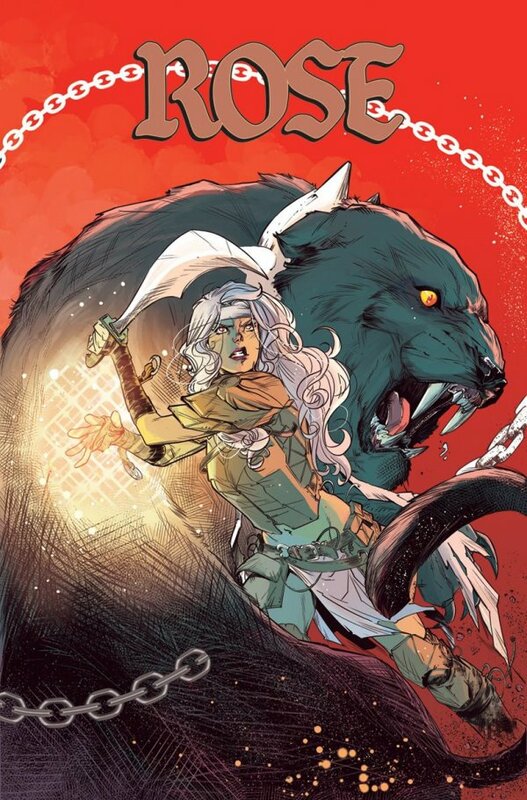 Ultimately, issue five served as a stronger climax to the initial arc with Rose uniting with her Khatz and issue six felt like the beginning of the second arc. Fans of the series will enjoy the character development but may see this issue as more of a bridge toward the next big event. Newcomers should begin at issue one to fully appreciate the direction the series is going.